My first middie!! 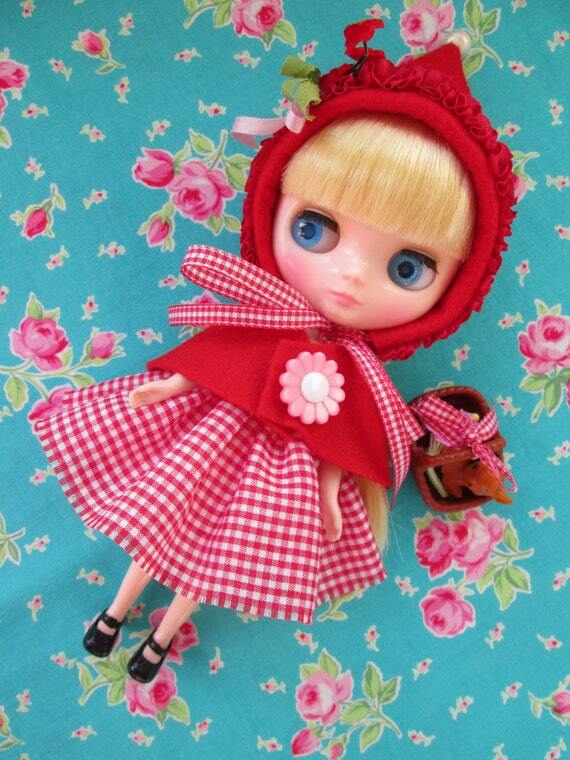 And my second Blythe doll! 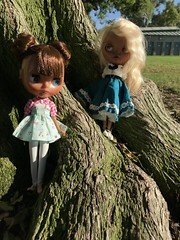 I purchased Oski tebyA lyublyU second hand from a youtuber who was looking to rehome her, along with a few of her other dolls (mostly BJDs). I think Oski tebyA lyublyU means “Oski loves you,” … so I guess her official name is Oski? I have no clue. I actually think I might call her Pixie, Sparrow, Wren, Bryn, or Thistle (as you can see… I’m still thinking about it). The last three names are contenders, and are also the names of 3 of the 4 hipster girls in the cancelled-too-soon-ship-didn’t-sail show ‘Selfie.’ The fourth girl’s name is Eyelet (just in case anyone was wondering :D). 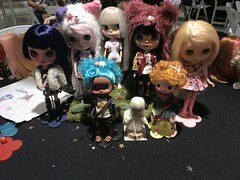 The size of the Blythe middie is sooo much smaller than I was expecting! This new girl seems awesomely portable and more discreet than a neo – I might try making her a carry pouch so I can take her places. Her hair is kind of frizzy and rough, so I might give it a quick wash and then a long soak in some fabric softener/water concoction. 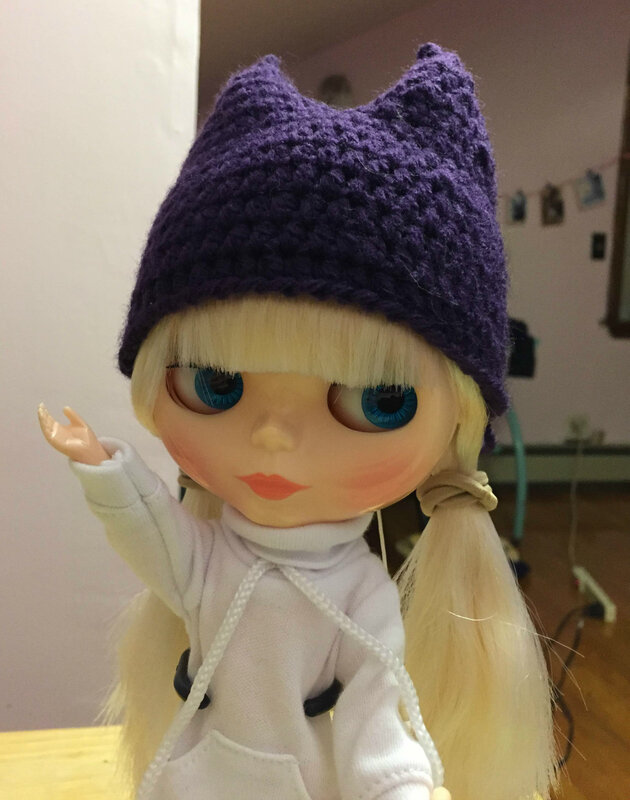 The middie’s hair is a warmer deeper blonde than Finley’s, and her eyes are a pretty light brown similar to one of Finley’s front facing chips. Her stock is super cute!! I absolutely love her red Mary Janes. I’m happy she came with her own white tights, since I would have bought her a pair anyway to avoid any clothes staining her legs. Her head piece is super soft and also very cute. I’m very happy I decided to get her! Weekends fly by so quickly that I hardly feel rested by this time each Sunday. 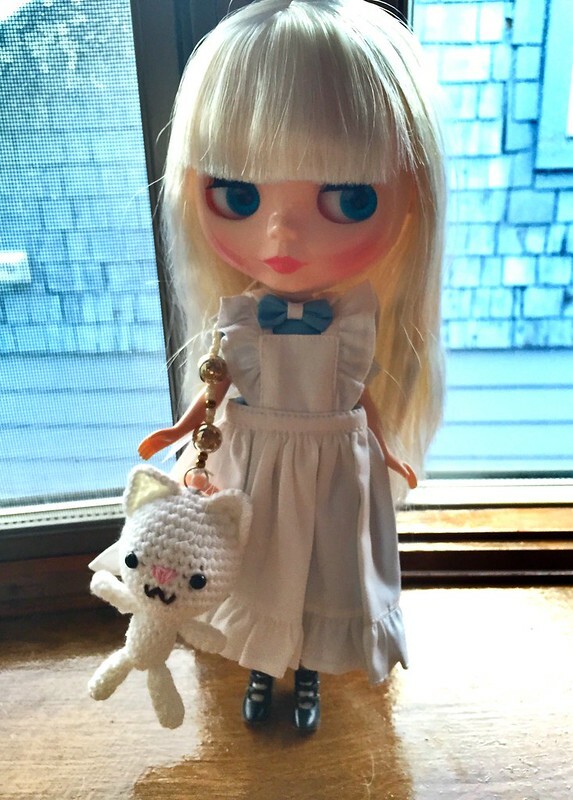 I spent the majority of this weekend crocheting… and e-window shopping… and actual shopping. 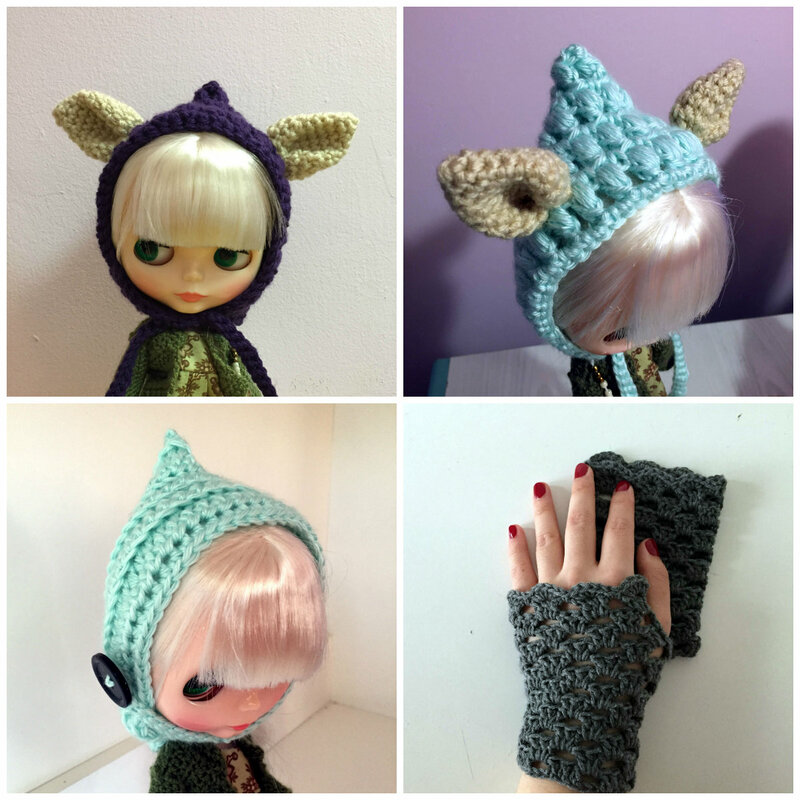 These pixie hats are pretty fun to make (all three are available on my etsy store). Finley’s hair is so pale, that her hair looks almost white in these photos. I try to keep her out of direct sunlight, for fear that she will suddenly turn yellow (:( I didn’t even realize this would be a thing until I heard it mentioned in a few youtube videos and on some blogs), but her hair caught some sun and it kind of glowed light blue/purple – which I thought was pretty cool. The gloves I whipped up last minute because my sister wanted me to teach her how to ice skate :D. I’m happy with the pattern for the gloves (which can be could be found on CreativeYarn’s blog). The pattern is a little tricky to follow, but once you figure it out, it goes fast! 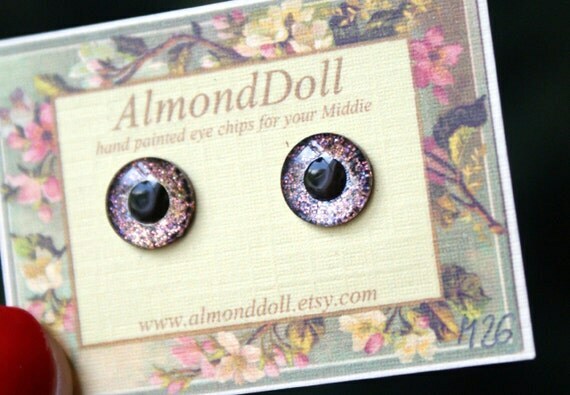 I also bought a pair of hand painted eye chips for Finley from etsy. I couldn’t help myself >_<. I really don’t like her stock orange eye chips. At first I was thinking of replacing them with hand-painted (…not by my hand) grey eye chips, but I saw this very beautiful, dreamy pair of artistic chips and went with those. 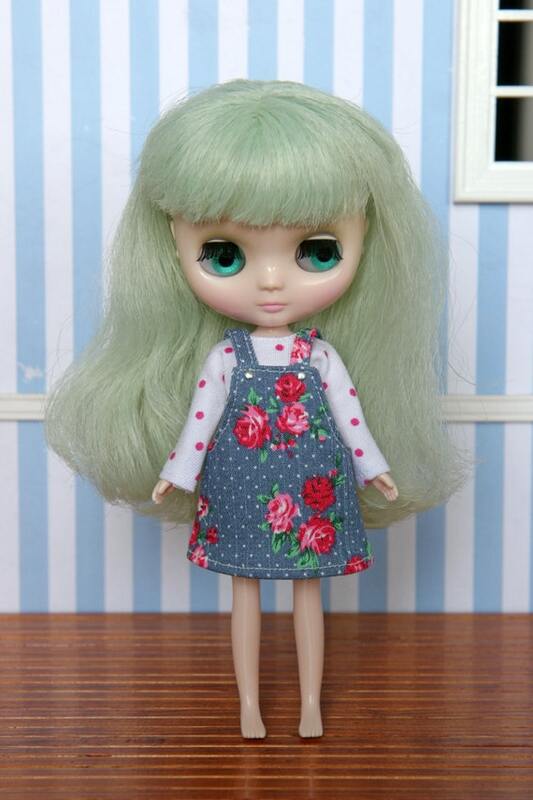 I may one day change Finley’s stock green eye chips with a pair of plain dark grey eye chips… or splurge and buy her another pair of hand painted ones :D.
When her new eye chips come in the mail, I think I may open up her head and do some light customizations. Gaze correction – I don’t really like having to take photos from lower than her eye level to make it look like Finley is looking at my camera. Lash replacement – I’m thinking of flared lashes! Mattifying her face – I’m not going to sand her face down, as I don’t really have confidence that I can do a good job, and redo her face up. I think I will just give her a layer of MSC UV flat, and touch her lips up with some gloss varnish. 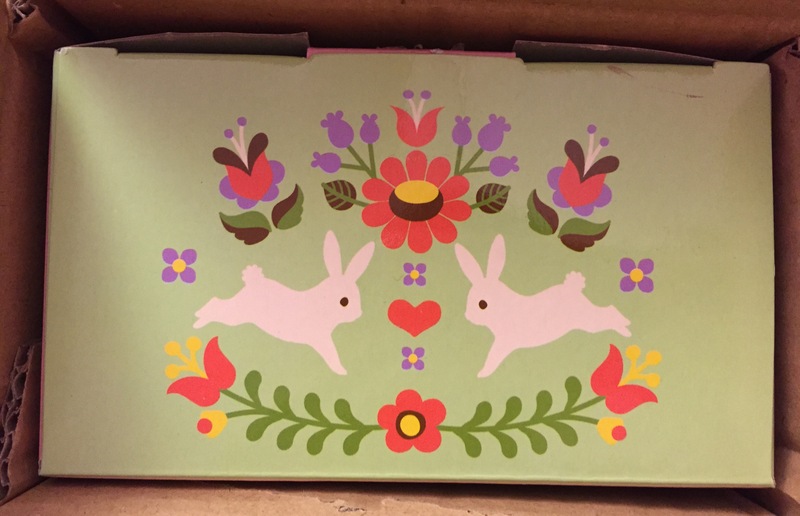 (Maybe) Lid decorating – I was thinking of a light taupe or light gold! Finley already has some brown eye shadow on her face plate – I want to put a complimenting color on her lids. Maybe glossy lids would look nice, since the rest of her face will be matte? Or I may not open her head at all. I’m scared I might crack her face plate >_<. 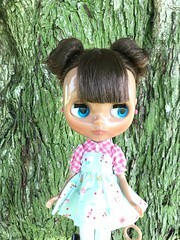 Annndddd, my prize from BlytheLife.com’s Easter Egg Hunt came in the mail! The sweater Michelle knitted is super cute :3. 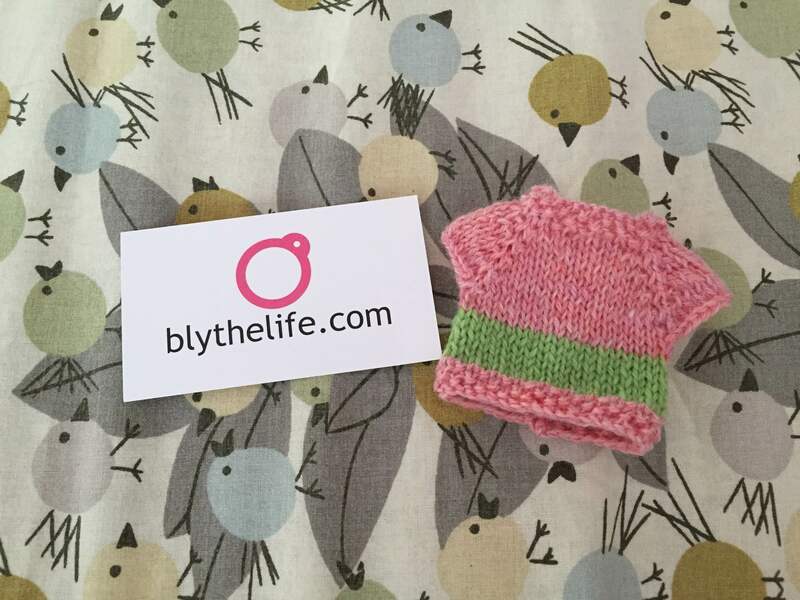 Blythe Life Easter Egg Hunt prize! Finley only has dresses at the moment, I need to get her more separates >_<. I wish I knew how to knit! One of the first things I do when I wake up is check my email, instagram, flickr, and this blog. I like to know what’s going on with my sites, and if there’s anything new. The bad thing about this is, that for most of my sites I am in one way or another subscribed to people who have awesome doll collections. 😦 I am currently surrounded by lemmings. I didn’t originally want the middie blythe Pixie Peaceful, and I actually wasn’t completely sold on middies until recently (the middies on All The Dolls’s blog helped convinced me that I needed one). HOWEVER, a number of the people I follow on instagram started posting photos of the doll out of the box. Pixie Peaceful’s pink eyelashes actually really work with her hair and face. She looks so unique! 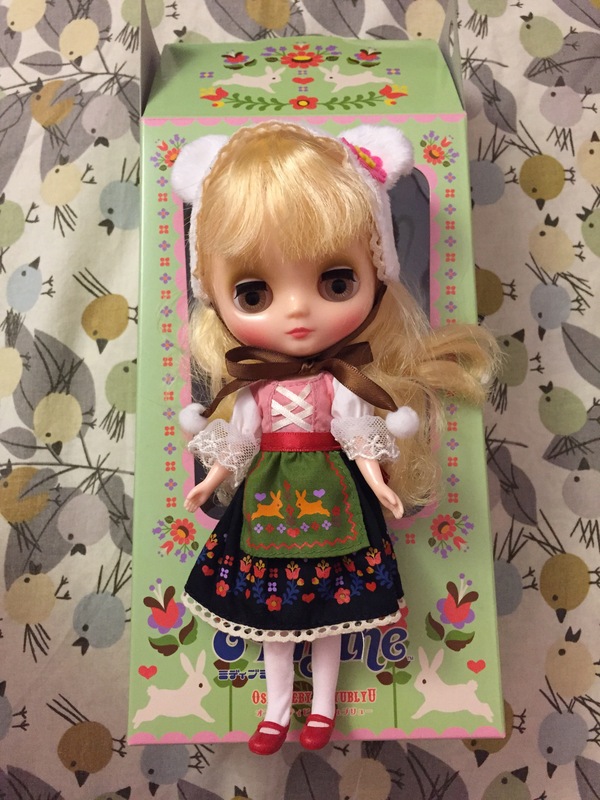 I really want this middie, but in my head I can’t shake the thought that for just a bit more, I can purchase a Neo Blythe (I really, really, really want Spright Beauty. really.). 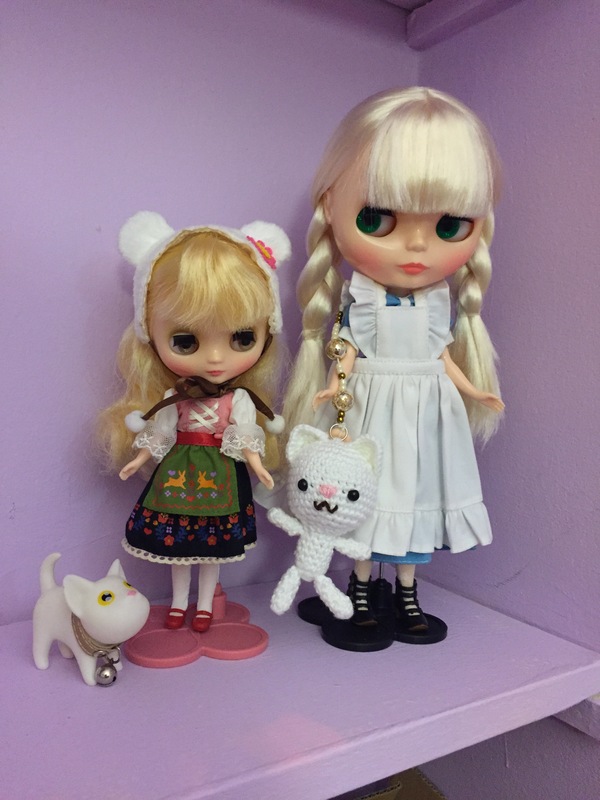 My blythe collection is very modest (Finley is an only child), and I just finalized the adoption of a different middie (just paid :D) – an Oski Tebya Lublyu! I couldn’t pass her up when I saw the owner was selling her :D. When she comes in the mail, I’ll post a ton of photos ^^. I will also probably give her hair a dunk, and try to style her bangs so that they sweep sideways. 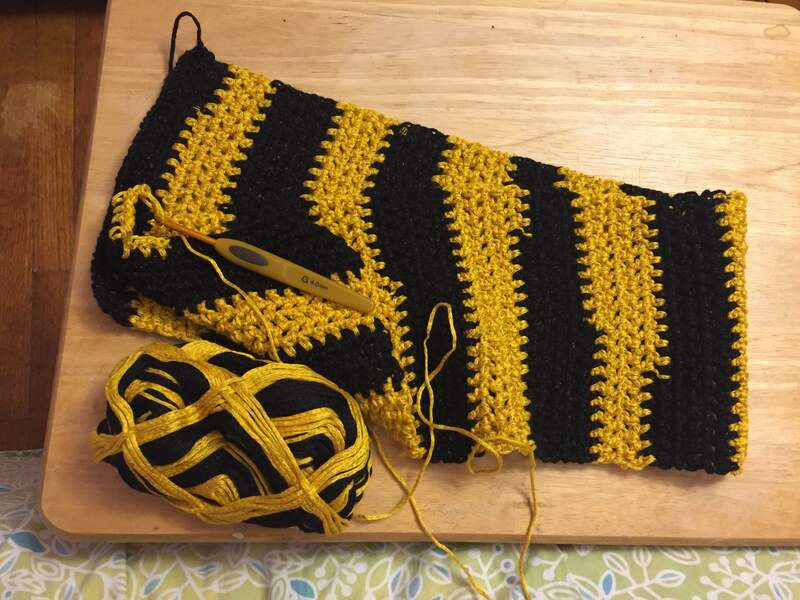 WiP – LET’S GO PENGUINS! The crocheted scarf is made completely of chains and half double crochets. You can find the pattern on ravelry under Martha Cowl Scarf. The yarn was on clearance at Michaels, and I purchased it a few weeks ago… and honestly, I just want to be done with it. I’m not a huge fan of the color combination. I also am not so keen on how uneven the stripes are. In the photo above, I would say that my two favorite things are the crochet hook and the pattern! I really like how flat the crochet hook is, and I think it’s awesome how short the hook is too. I have a couple of long hooks, which I find hard to use since I like having my hand close to the hook as I work. These hooks by Clover are available at Michaels. I’ve accumulated so much yarn, that I sometimes feel unproductive if I don’t get through at least one skein in a week. I really like Pickle Winkle’s hat (how did they come up with her name?? 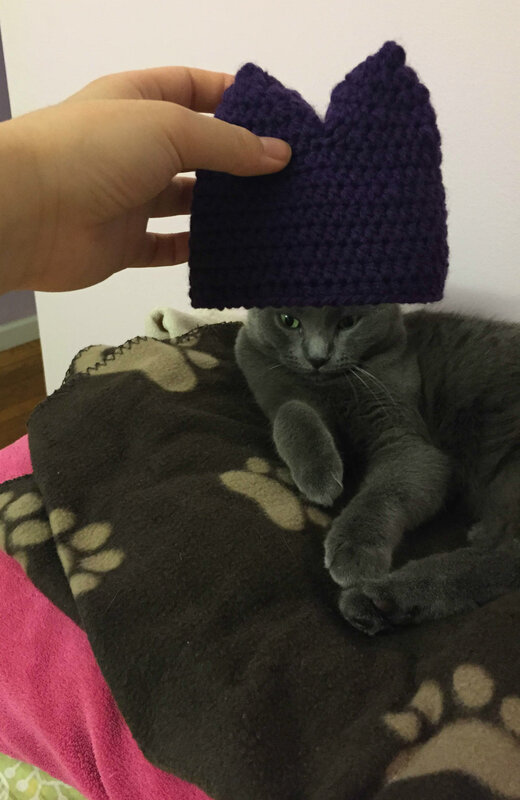 ), and I thought I’d try to crochet it since it’s a pretty basic shape. I might add a crescent moon on it, just for fun. Their hands are actually rubber banded together. Thought that was cute. I just got this set today :D.
To be honest, I’m not sure what I am going to do with Hunter Huntsman. 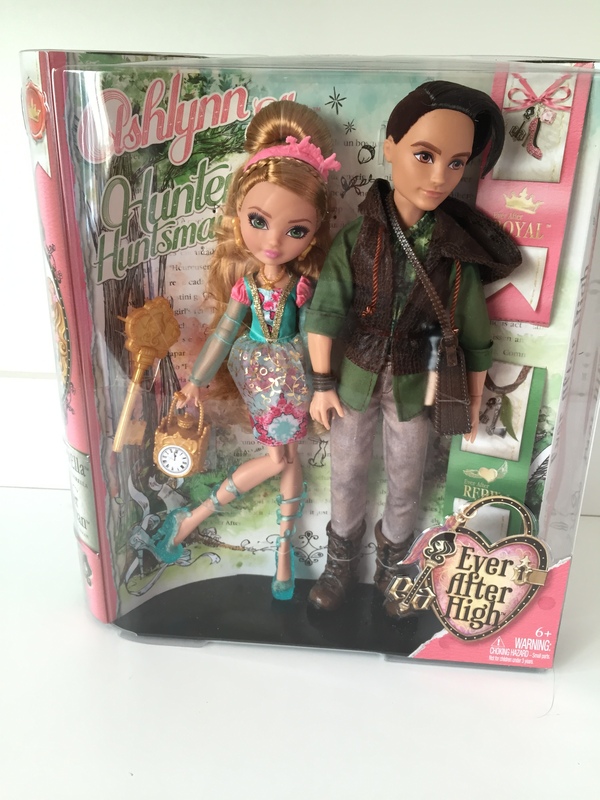 If I repaint Ashlynn, then I would feel inclined to repaint Hunter so they match… but I don’t think I’ve seen a good Hunter Huntsman repaint. And I’m also not sure I can draw a boy’s face. Lol, his hair is so funny. He has some kind of fuzzy material on the sides of his head to mimic super short shaved hair. I didn’t realize that both sides were shaved. I originally thought that Hunter had some kind of Skrillex cut. Today feels like a granny square kind of day. A bad day for me is more normal than a good day. I had another awful day at work. Being the lowest ranked in my department, I’m kind of the person everyone feels like they get to push around. I got so frustrated at my life situation (I know my life could be worse), I bawled like a crazy person on my walk home from work. Ugly crying. I was expecting one of my Etsy orders to arrive today, but when I checked the tracking in the middle of the day, there was a notice on the USPS website saying that they could not deliver the package and that it would be sent back to the sender… ALL THE WAY IN THAILAND. Thankfully, I managed to pick up my package, which contained this adorable Alice in Wonderland inspired dress and apron. It came with a long black ribbon, but I was having difficulties tying it onto Finley’s head. Instant mood lifter. Amirite? 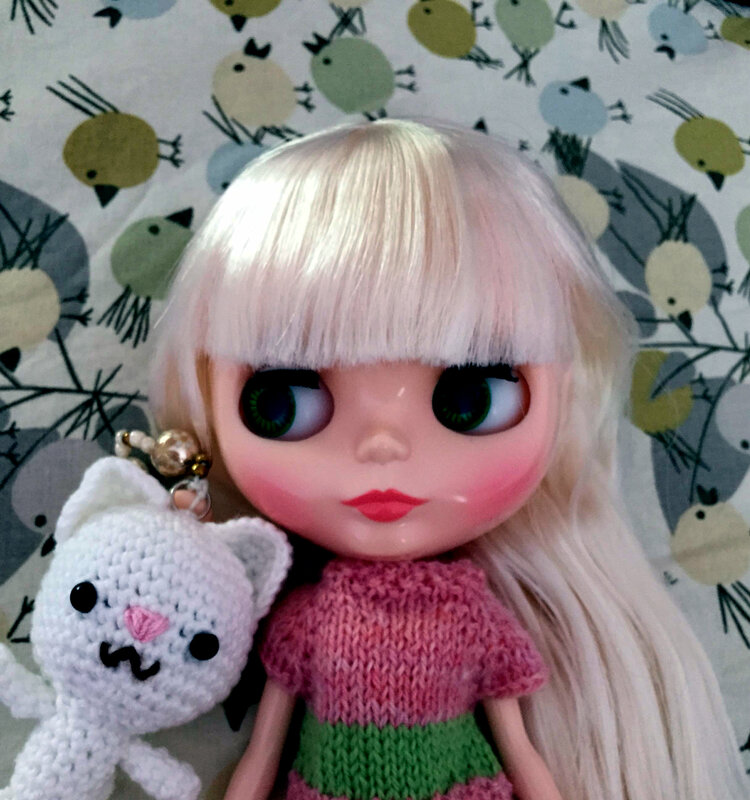 The outfit above is from BlytheBerryGirl’s Etsy store. 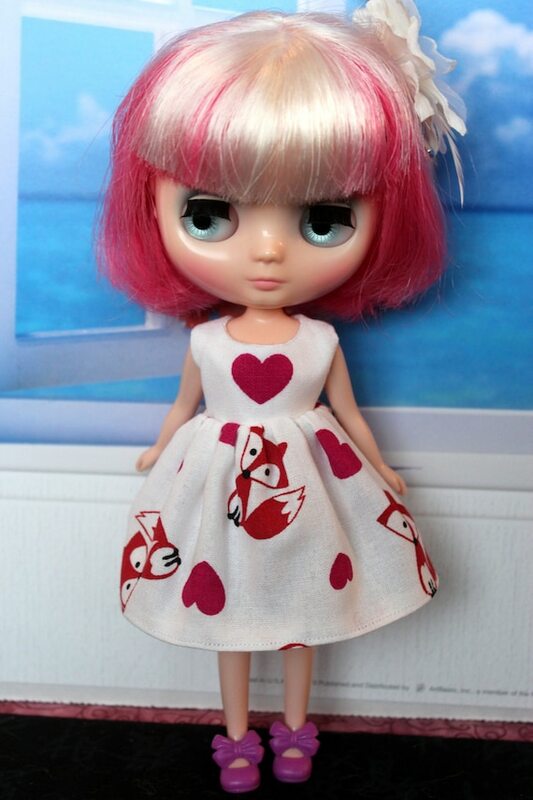 … I was so upset, I actually ended up making a new order on Etsy for two beautiful dresses. Now I’m off to crochet a ton of granny squares out of the leftover yarn skeins I have. One day, I will have a rainbow granny square crocheted blanket. It will be both ugly and glorious.